Want to save money, rescue your skin from hundreds of toxins, and get dolled up? 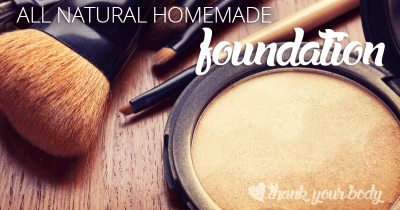 Well, look no further than this create-your-own DIY makeup routine with all the natural makeup recipes you need to get started! But now, I really enjoy chances to get dressed up and look purdy. It’s fun. (And no longer just a mask). I love the options and the ways makeup can enhance your natural beauty. But what I DON’T like are toxins… And turns out that makeup (even the most expensive, name-brand kind) is FULL of them! Corporations didn’t care what went into their products, as long as they sold and the ingredients were cheap! This mindset continues today. Even now, the FDA doesn’t assess personal care products or cosmetics. They’ve banned very few chemicals, and companies don’t even have to list everything in their ingredients! So what is in makeup? As an example, if you see “fragrance” or “parfum” in the ingredients of a product, you’d have no way of knowing what chemical soup it’s made up of (Hint: it could be a mixture of up to hundreds of ingredients, including neurotoxic chemicals, environmental toxicants, carcinogens, allergens, and endocrine disruptors). Ick. Of course, everything is supposed to be “safe in small amounts”. Right? Well generally, women use 12 products on themselves daily, and men use around 6. Even if it were safe, (and generally, we don’t have the research to validate that claim) we’re using these chemicals all over ourselves, every day. 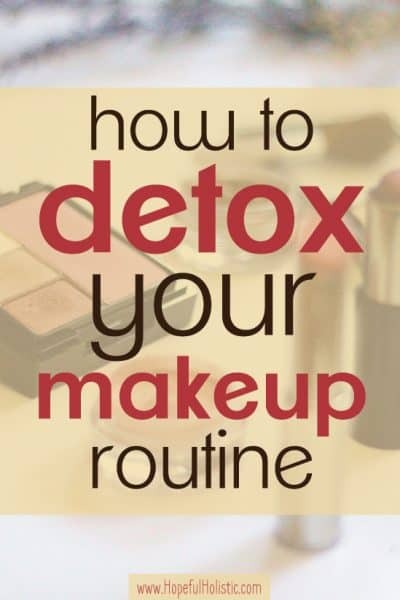 Time to detox your makeup? I get it. Natural makeup recipes aren’t as easy as just buying makeup. And buying all new makeup (or ingredients for DIY makeup recipes) can be pricey. But, back to the toxins. Isn’t it best to err on the side of caution? I’ll admit, cutting out all dangerous chemicals won’t cure you of every disease and keep you from dying, but- it’s a start! It’s a huge step towards living healthfully and holistically. We can’t completely eradicate chemicals from our lives, because they’re everywhere, but we shouldn’t live in fear. Why? Because we can be informed and make smart decisions when we shop, and know we’re doing good for our environment, ourselves, and our families! To see how your current self-care products line up, you can check out their safety rating at EWG.org/skindeep. Reducing our exposure to toxins in our environment is one of the ways we can help give our body the best chance it has to fight disease, heal, and thrive. Do something good for your body both now and for years to come… and reduce the toxic load it has to deal with! We can reduce our exposure to toxins- and look good doin’ it. So how do you make your own makeup? And what if you don’t like the DIY stuff? Surprisingly, the options for a toxin-free makeup routine are a ton easier and cheaper than I thought they would be! Below, I’ve rounded up a list of ways you can detox your beauty routine with DIY makeup! It should be everything you need to be able to transform your beauty routine into a non-toxic, all-natural, DIY adventure where you know every ingredient you’re putting on your skin is safe! Of course, not everyone is a fan of DIY. If you’d rather shop for makeup online, I’d recommend Orglamix. 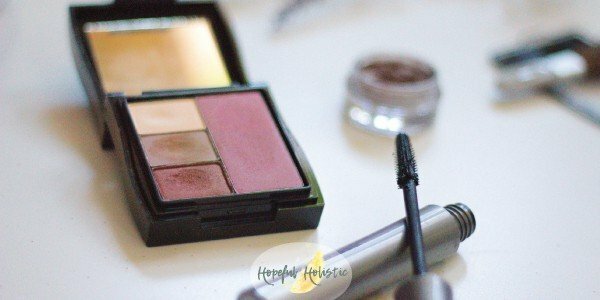 This is a fantastic non-toxic makeup brand! They have a huge selection of cruelty-free, non-toxic, 100% natural mineral makeup– everything from blush and bronzer to eye kits and glitter. I have some of their sparkly eyeshadows and I love them! They’re well-made, shimmery, and stay on and light up my eyes all day. I’m pretty sure no one would believe me if I told them it was all-natural. Don’t have time to DIY? There are clean store-bought suggestions under each category as well! And now, if you want to get your hands a little dirty and make your own all-natural makeup routine, read on! Note: If you have any sort of reaction to any of these ingredients, stop using them right away. Some can be irritating if you’re using them for long periods of time, so make sure you’re removing your makeup every night. 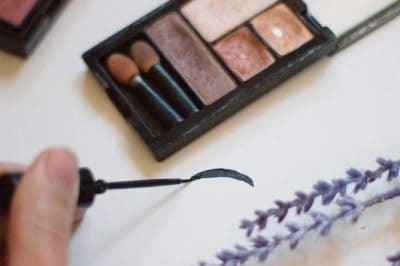 Here are my picks for the best non-toxic makeup recipes out there, from cleansing all the way through your makeup routine! Use these recipes to get a glowing, fresh, toxin-free face of makeup in no time. Of course, any good beauty regimen starts with a clean and fresh face. Leftover makeup or old sunscreen can block your pores, making you greasy and prone to break-outs. I’d highly recommend this charcoal facial bar for cleansing. The charcoal helps your skin detox, and it has coconut milk and mango butter for a gentle, nourishing cleanse. And here’s an all-natural gel cleanser you can use that won’t leave a residue- but will leave your skin feeling soft and nourished! 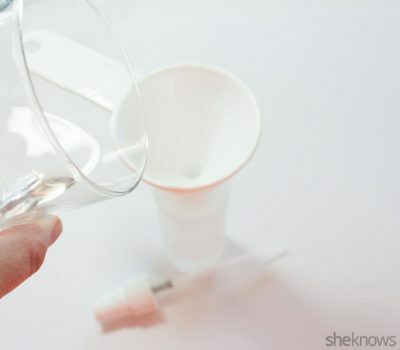 If you want to make your own, try out this DIY face wash! You can use a foaming soap bottle to make it a foaming cleanser- just like the ones you buy from the store, except not carcinogenic! I’d recommend this soap bottle- it’s glass, so besides looking snazzy, it will help you use less plastic! 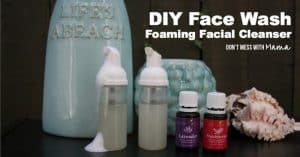 This recipe uses almond oil to hydrate your skin, and the frankincense and lavender essential oils fight acne and dry skin, and will make your face smell lovely! Find the recipe for DIY face wash here. Concealer is one of those things I always thought was a little bit counter-productive… If you have a blemish (quite possibly due to clogged pores), why would you clog your pores with more goop just to cover it up? Seems like you’re just making the problem worse. And looking like a frosted mess while you’re at it. But this recipe changes all that! It’s full of ingredients that are anti-acne, like rosehip oil and sea buckthorn seed oil, and also has vitamin E oil to help your skin heal. It even uses oxides to match to your exact skin tone! Just add color little by little and test away. Get the healing concealer recipe here. If you aren’t feeling the DIY today, (this is a little bit more complicated of a recipe) here’s my pick for a good light-weight, creamy concealer you can try. I’ve found it super tough to find a good all-natural foundation. Chemicals can help foundation products stay put, not be too thick, match your coloring, and come off easily at night. But you can get all that without the toxins too! This recipe also leaves out known irritants -even the more natural ones- and leaves you with a functional, healthy, all-natural foundation that you can personalize to your skin color! You can leave it as a powder or use jojoba oil to make it more of a cream. If you’re looking for a non-toxic store-bought option, here is a fantastic 5-in-1 foundation that works as a concealer, corrector, foundation, finishing powder, and SPF! Not bad eh? And this mineral foundation smooths fine lines while self-adjusting to your skin tone! Magic. 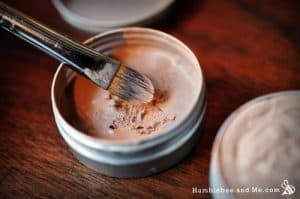 This DIY blush recipe uses different combinations of three different powders-rose mica, arrowroot, and cocoa powder– to make three different shades that will work with anyone’s natural skin tones. Enjoy your blushingly good looks– sans toxins! Find the blush recipe here. If you’re looking for a blush to buy, here’s a lovely mineral blush, and a cheek (and lip!) tint can be found here. I’ve always wanted to have an excuse to spend hundreds of dollars on a highlight/contour kit where I could make myself glow… But I’m never gonna spend that much since I found this. 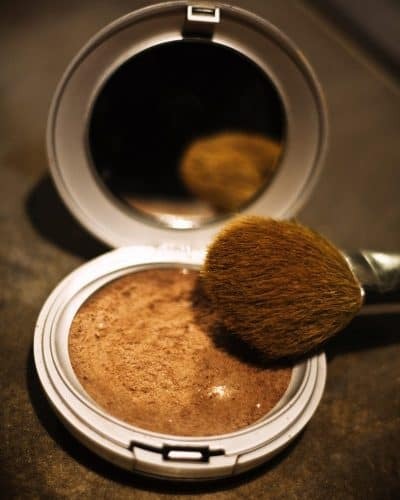 Put your mixture in 1-ounce tins and apply it when you want to shimmer! You can find the recipe for cheek and brow highlighter here. If you’d like to shimmer without so much effort, you can buy a cream highlighter here. And there’s also a sparkly mineral highlighter! Warning: You’ll look AND smell incredible with this recipe! It uses ingredients you can find in your kitchen- like cocoa, nutmeg, and cinnamon, to create a bronzer and contour that’ll make your face’s superstar qualities shine. You can personalize this to be more of a bronzer or a darker contour powder, and you get to choose whether it’s powder or a compact consistency! Gosh I love DIY recipes. They’re so accommodating. Go for a light application the first time you use this- a little goes a long way! Find the recipe for bronzer and contour powder here. And if you’re looking for a bronzer that’s straight not from the kitchen, Orglamix has a glowing mineral bronzer -that doubles as a luminizer and finishing powder- and here is a matte bronzer option. Lipstick is that one special touch that can transform you from a normal, everyday look, to a WOWZA-magical-T-Swift-super-power-channeling look. 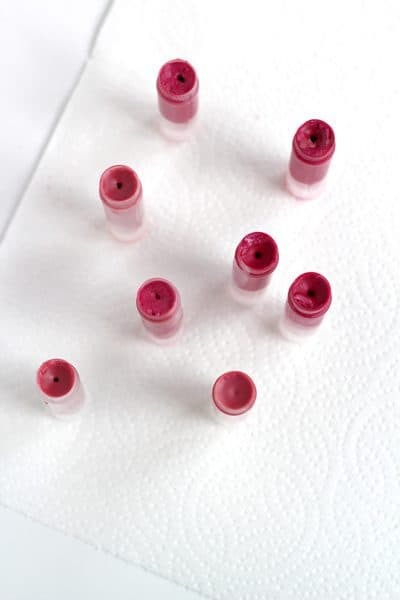 You can store your new favorite lipstick in a tin or a chapstick tube for easier application. If you’d like to purchase your pout, you can try this hydrating lip tint! Eyeshadow is so much fun… In my crazy younger days I would color my lids in half hot pink and half teal. Thankfully, I opt for more natural colors now, but I still enjoy putting it on! 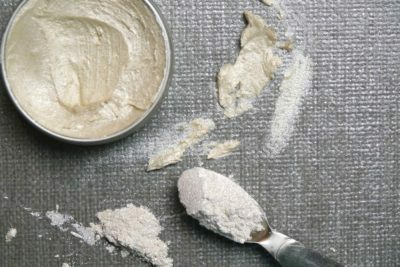 This recipe uses lots of the same ingredients as the other recipes, including mica powder, arrowroot starch, kitchen spices, and jojoba oil. One thing it uses that you might not have yet is bentonite clay. Bentonite clay is rich in minerals, good for the gut, and a detoxifier. It’s useful as a face mask, for skin irritation, in a detox bath, and more! Find out more about its uses here. Enjoy finding fun color combinations! Get the recipe for mineral clay eyeshadow here. 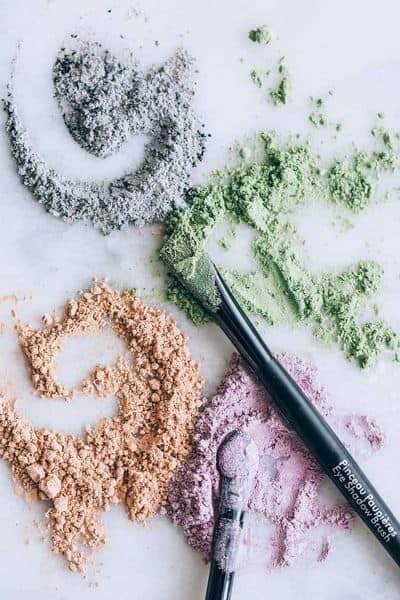 If you’d like to peruse some other options, there are dozens of natural, organic eyeshadows on Orglamix, with lots of fun shades to choose from! So I thought liquid eyeliner would be one of the most complicated to make, but it’s actually one of the easiest recipes here! There are only two ingredients- activated charcoal and jojoba oil. These wonderful ingredients are useful in detoxing, have healing properties, and are antibacterial, making this recipe both makeup, and a healthy skin care product! You can find the recipe for liquid eyeliner here. If you’d rather not do DIY, here’s a liquid eyeliner, and here is a gel eyeliner that will help condition and thicken your lashes! Mmmmm, mascara. Did you know that even some “organic” brands can have sketch ingredients? Not to mention they’re crazy expensive. This recipe, however, is totally safe, won’t dry out your eyes, and makes your eyes pop! 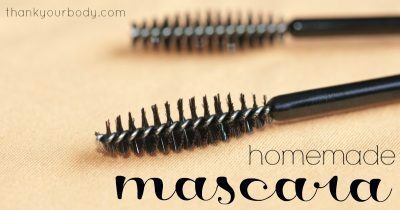 Find the recipe for DIY mascara here. If you’d rather buy an all-natural, organic mascara, this mascara is great! Now if you’re in a hot or humid climate, you’ll definitely want to use a makeup setting spray unless you want all that hard work you’ve done on your face to go to waste! It uses either glycerin or aloe vera, along with witch hazel and essential oils of your choice! They’ll also make your face smell fab! You can find the recipe for makeup setting spray here. Lots of people like using plain coconut oil as a makeup remover, but I find that the oil feels greasy for a while afterward and doesn’t work great for my eyes. What I love about this recipe is that Whole New Mom has really done her research- read this and you’ll find out which recipes DON’T work, and why you shouldn’t be using the chemical stuff (never ever again). 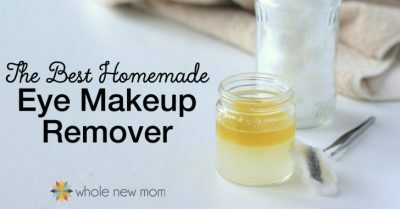 Find the recipe for DIY makeup remover here. If you’d like to buy a cleanser, this gel cleanser can remove makeup along with leaving your skin feeling firm, toned, and soft! Or if you’d like, you can try cleansing water -just like they use at Fashion Week. It’s a paraben-free, soap-free, sting-free cleanser that removes makeup and helps to hydrate and protect your skin! 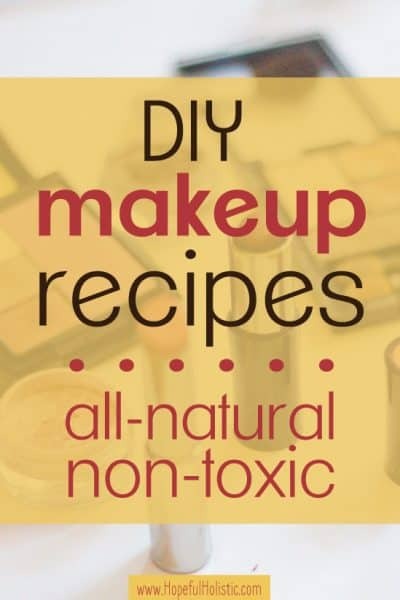 I hope you enjoy these recipes and tools for reducing the toxins and chemicals in makeup! Want to go one step further in cutting out toxins? You can learn to make your own non-toxic hand sanitizer, make your own household cleaners, or get my guide to reducing toxins! When you sign up for my newsletter below, you’ll also get my guide to help you reduce toxins. In it, you can learn how to get some common chemicals and toxins out of your house and body, minimizing your risk and exposure while on your health journey! There’s so much info here! I have just stopped wearing makeup after having issues with sensitivities, but really want to start again. Thanks for this post! So many beautiful makeup recipes! I DIY just about everything, but makeup I have yet to try. Thanks for the inspiration!! Makeup’s a fun one to DIY =) Enjoy!